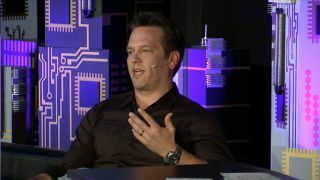 Phil Spencer made a fun appearance the PC Gaming Show tonight, where he took a bit of a low-key approach as he discussed Microsoft's plans for the future of gaming on Windows 10. One of the first things Spencer did was acknowledge that, despite its promises over the years, Microsoft hasn't always been a great champion of mouse-and-keyboard warriors. "There have been times in our past where Microsoft has maybe lost our way with PC gaming," he said. But the coming launch of Windows 10 provides it an opportunity to address some of those shortcomings: The free Windows 10 upgrade offer is intended to get the operating system onto as many PCs as possible, which will help simplify the process of creating games. He also revealed that the fighting game Killer Instinct is coming to the PC as well. "We're going to bring Killer Instinct to the PC," he said, "and we're going to allow people to play on PC, to play on console, to play back and forth." Spencer didn't say whether that was a reference to the possibility of cross-platform play, or when the PC version of Killer Instinct will launch, but it's coming—and that's a start.